A long studied and viewed Denali National Park wolf pack is on the verge of disappearing. The East Fork pack ranges near the park entrance, including on state land wolf advocates want closed to harvest. The fate of the East Fork pack has also inspired a call for closer pack monitoring and rescue of any orphan pups. The last known adult male of the East Fork Pack was observed from the air to be dead at a hunting camp on state land outside the park’s northeast boundary in early May. Park natural resources team leader Dave Schirokauer said the pack’s other known remaining member, a pregnant female, denned nearby. Schirokauer said the wolf den will continue to be monitored for activity from the air, but the chances of a mother and pups surviving alone are slim. The East Fork Pack has been studied for decades and used to be popularly viewed by park visitors. 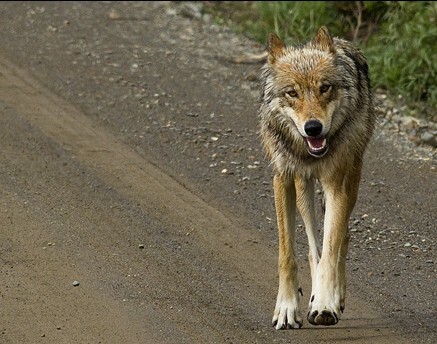 Denali wolf advocate Rick Steiner said the current situation follows loss of an East Fork pack breeding pair to harvest in the same area last year. The pack’s decline is part of a more general dip in Denali’s wolf population, that’s inspired unsuccessful efforts by Steiner and environmental groups to get the state to close the land east of the park along the Stampede Road to wolf killing. Aside from the broader debate about whether or not to protect Denali wolves on state land, Steiner is pushing for on the ground monitoring of the East Fork pack, and taking any orphaned pups into captivity. The Park Service’s Schirokauer said the agency favors letting nature take its course, noting even if it wanted to act, it doesn’t have jurisdiction. “Given that the den is on state land, it’s really up to the state if there’s any sort of human intervention,” Schirokauer said. Alaska Department of Fish and Game regional wildlife supervisor Darren Bruning does not rule out the possibility of taking orphaned wolf pups into captivity, but said it needs to be clear the pups are alone. Bruning noted 2 situations in recent in which clearly orphaned wolf pups were removed from the wild and given to care facilities or zoos. He said the state is not actively monitoring the Denali East Fork Pack den, but is getting regular updates from the National Park Service. The Park’s Schirokauer said a single pup was observed during a June 17th overflight of the den area.